The holidays are just around the corner. I guess you’ll be invited to a lot of parties in the next couple of weeks. For some people, parties are all about eating and drinking, and more often than not, in excess. 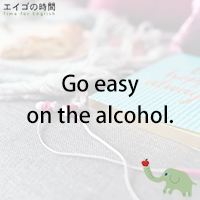 If that sounds familiar to you, then here’s a good phrase for you: to go easy on something. To go easy on something means not to eat, drink or use too much of it. For example, you like drinking. But if you drink too much, it can become less about fun, and more about regrets. So, go easy on the alcohol. Likewise, if you want to lose weight, you should go easy on cakes and cookies. It doesn’t have to be something to eat or drink. Let’s say, if you want to save battery on your smartphone, go easy on video and games. Next Post よろしいかしら？ – May I?